Plants exhibit regular, cyclic physiological changes of many sorts. For example, leaflets of wood sorrel, Oxalis, fold downward to a vertical position at night and return to their normal horizontal orientation during the day. Because this rhythm takes place over a period of approximately twenty-four hours, it is called a circadian rhythm. Forces within the plant control the movements of wood sorrel and many other circadian rhythms. This is easily demonstrated by placing wood sorrel in total darkness for several days. In the absence of external light stimuli, the movements continue in an approximate circadian rhythm, but the period tends to lengthen slightly to approximately twenty-six hours. A rhythm that is controlled by an internal timing mechanism, the so-called "biological clock," is an endogenous rhythm. Environment can affect endogenous rhythms. By changing the photoperiod scientists can alter the period of a circadian rhythm as long as the imposed photoperiod does not differ significantly from the normal circadian rhythm. Altering circadian rhythms by varying one or more environmental parameters is called entrainment. Phytochrome, an important plant pigment, and blue light receptors regulate entrainment. Why should a plant like wood sorrel fold its leaves at night? German botanist Erwin Bünning suggests that the folding of leaves at night hides them from moonlight, which could disrupt the plant's ability to measure night length accurately. Thus, wood sorrel can use its internal biological clock to anticipate the middle of the night, when a moon might be full. 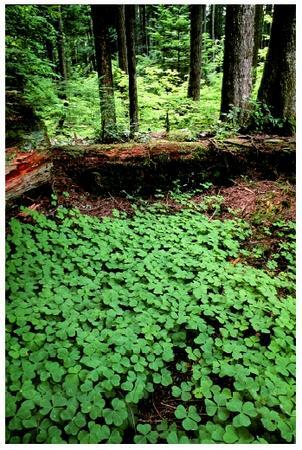 An old-growth forest with an understory of wood sorrel in Mt. Hood National Forest in Oregon. Plants exhibit regular, cyclic physiological changes of many sorts. rhythms of plants include opening and closing of stomata , growth rate of stems and roots, opening and closing of flowers, production of floral scent, and carbon dioxide uptake. Sweeney, Beatrice. Rhythmic Phenomena in Plants. San Diego, CA: Academic Press, 1987. Thomas, Brian, and Daphne Vince-Prue. Photoperiodism in Plants. San Diego, CA: Academic Press, 1996.